Seam bowler Muhammad Azharullah will leave Northants at end of the season. The 31-year-old has been a big success story at the County since joining after a stint in the Yorkshire leagues in 2013. 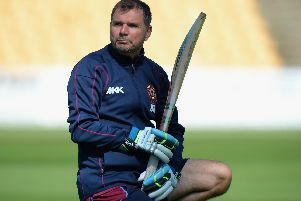 He made an immediate impact, playing a key role as the Steelbacks claimed glory in the T20 competition. Azharullah has continued to establish himself as one of the most skilful white-ball bowlers in the country with controlled swing and a devastating yorker to baffle the best batsmen. The seamer finished 2014 as the club’s leading wicket taker in the County Championship and went on to claim a further 45 first-class wickets the following season. The right-arm quick has taken an impressive 172 first-class wickets for Northants in 58 appearances, also claiming 53 List A wickets and a total of 70 T20 scalps during his time at the club. Northants chief executive Ray Payne said: “We’d like to thank Azhar for his contribution to what has been a very successful four years for the club. “He has proved to be a great addition to the squad and has played an integral role in our achievements.